Jiawei Shen’s self-portrait is modeled on a photograph by John Thomson (1837–1921), a pioneering Scottish photographer, geographer and traveler whose images of China and Southeast Asia brought the land, culture and people of the Far East alive for the ‘armchair’ travelers of Victorian Britain. One of his well-known photographs was A Hong Kong artist (1870–72) about which Thomson wrote: ‘There are a number of painters established in Hong Kong, but they all do the same class of work… making enlarged copies of photographs.’ When Shen moved to Australia in 1989, he found himself in a similar situation when he worked as a portrait sketch artist for tourists in Darling Harbour. Mei Quong Tart (1850–1903) was a leading 19th-century Sydney merchant from China. A famous, well-loved personality, he made a significant impact on the social and political scene in Sydney at a time of strong anti-Chinese sentiment in Australia. Shen began researching him 15 years ago and has painted many works on the subject. 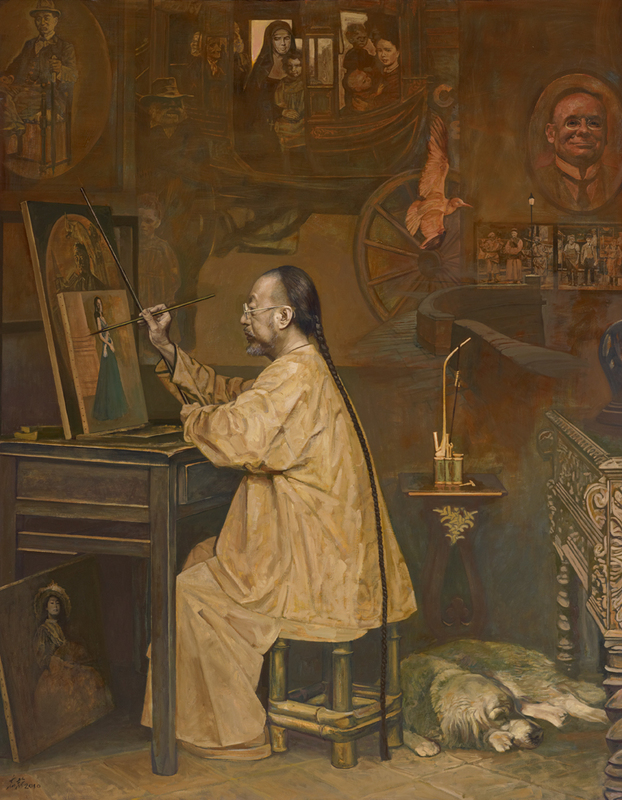 Based on the composition of Thomson’s photograph, Shen has copied the costume, hairstyle and furniture, and painted himself as a 19th-century Chinese–Australian artist. He is surrounded by many of his own paintings including his prize-winning work Mary MacKillop of Australia (1994), his portrait Princess Mary of Denmark, and several of his Quong Tart works. There is also portrait of his daughter Sidney under the desk and one of art critic John McDonald on the wall. His golden retriever Billy lies on the ground. Shen has never smoked but his grandma used a water pipe similar to the one in Thomson’s photo so he kept it in the painting.